We are living in turbulent times. The “old world” we have known and fought against is crumbling. However, “the new” that is currently emerging does not come about with any signs of positive change. Rather, this is a “time of monsters” appearing all too clear and in frightening speed! In this mess, political responses of global capitalism vary from the „business as usual“ of the neoliberal élites up to old and new populist right- wings, that offer nationalist and protectionist proposals with a return to reactionary, authoritarian and deeply asocial modes of ruling. In their competition for political power, they presuppose and feed into each other. It truly is the time of monsters! A time of systematic denial and restriction of fundamental social and civil rights to all, a time of intense social and political precarity, a time of “the survival of the fittest”. This situation of instability and unpredictability is different from the one we faced in 2015, the height of our “European struggles”. It is full of contradictions, challenges but also opportunities. For example, the results of the referendum on constitutional reforms in Italy indicate a broad refusal of neo-liberal strengthening of executive power, and a large demand for democratic participation. At the same time, several upcoming national elections are dominated by conservative to racist far-right parties and discourses. In particular the presidential elections in France and the federal election in Germany next year will be crucial moments with long-term effects for Europe. There is still the possibility that the development of intense conflictual social dynamics pushes forward radical social and political transformation towards freedom, equality and democracy. Let ́s look at the many impressive practices and struggles taking place already to defend the commons, social and civil rights – whether it is the struggle for women’s self-determination in Poland or the struggle for “rebel cities”, whether it is the fight against the neoliberal labour reforms such as the Loi Travail, the manifold (anti-racist) rights4all campaigns or the struggles against the capitalist management of the crisis and austerity policies in Europe that we were engaged in ourselves. However, we believe that we also need points of coming together of all these experiences, to find points of convergences in order to push together for a “Europe of struggles” in 2017. We refuse to return to the narrow dimension of National States and to their „old reac- tionary values“ to restore. We think instead that, to struggle against the „monsters of our times“, the transnational level is the possible and necessary one to affirm and to fight for an alternative, both to the maintaining of „status quo“ and to the nationalist and authoritarian populism. It is quite clear that the next major opportunity for converging, as forces involved in Blockupy International and for the full European constellation of “anti-austerity” and “anti-neoliberal” forces, could and should be the upcoming G20 summit in Hamburg on July 7 and 8 July2017. So far the mobilization will take place in a “compact week” – with a counter-summit on July 5 and 6 (before the official summit), with a broad mass demonstration on July 8 (second day of the official summit) and of course with civil disobedience actions during the entire summit (but primarily around July 7). A concrete “NoG20” process is already on its way in Germany, yet, it apparently lacks the politically necessary „trans-nationalization“ in content, character and mobilization. Therefore, we call upon all European networks and movements to think of the G20 protest as a process to convene and to transform it into our common “stage” that is not simply reproducing political discourses, forms of organisation and struggle coming from the “anti-globalization movement” of fifteen years ago. The current „organized chaos“ of global financial capitalism, devoid of one imperial power leading a unique global command, but yet so capable of producing wealth and prosperity for a very few, exploitation, misery and death for many, requires new responses. The G20 could be an occasion to “translate” our transnational discourses and practices in a more global language, to “de-colonize and de-provincialize Europe” from below. And, it could be the opportunity to address and counter the “parade of monsters”, which will take place in Hamburg’s “red zone”, not simply targeting the single leaders (Trump and Erdogan, Modi and Putin, Temer and whoever will be elected on its way), but fighting the neoliberal and authoritarian political options that they are representing and embodying. It could be a place to offer a positive and strong vision of our Europe − a Europe of solidarity, for all and without borders − as a credible alternative to all globalization critiques coming from the right. We will continue to fight for the universality of social rights, born out of a Europe of struggles. We urge you to think of this process as a common convergence platform, capable to concentrate in Hamburg the social counter-power of rupture and disobedience, to build connections and alternatives. Thereby, we under- stand the G20 mobilization rather as a “stage” than a goal in itself: a possible point of converging “on the streets” which European movements could and should use as a step in a longer process, highlighting that our struggles will continue after the G20 summit and that we will gather after the G20 mobilization in order to evaluate where we are at then. At the end of November, on the occasion of the AlterSummit meeting in Brussels, we met to consult on the possible role of Blockupy International within the mobilization against the G20. We met as people coming from different networks and movements across Europe, including Solidaires, Sud PTT and Attac France, EuroNomade, European Alternatives and DiEM25, Transform, AlterSummit, Act! 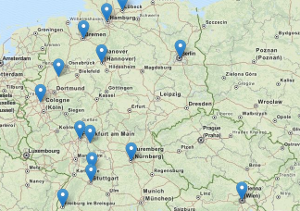 and DIE LINKE as well as Plan C, Occupy Frankfurt, Social Centres from Emilia-Romagna and the interventionist Left. We shared the opinion that the dynamic and stage opening up around the G20 could be a chance for our transnational struggle and process. Moreover, we discussed the possibility of Blockupy International (without any pre- sumption of “branding” or foolish ambitions of subsuming everything that moves in Europe) supporting as political infrastructure, promoting and bridging the G20 process on a European level and above all to encourage the integration and active participation of other international forces within the existing anti-G20 preparatory process. There are already possible intermediate milestones of this path to follow: the 18th of March a mobilisation around the G20 Finance Ministers meeting in Baden-Baden and the same day in which the City Plaza Hotel (from Athens -Greece) called for an international action day against austerity, freedom of circulation and social rights. Another date is the 25th of March when the upcoming protests against the EU Chiefs of gov- ernment summit for the 70th anniversary of EC Treaties in Rome take place. Another point could be the G7 meeting on climate and environmental issues planed in Italy for June. And of course, there are more – es- pecially in the process of several national frightening election campaigns and (truly neoliberal) steps to- wards the Brexit. Nevertheless, as a focus, we propose as Blockupy International to all networks potentially interested in this renewed transnational process to discuss within your networks and movements the upcoming G20 mobilization as a cornerstone for this and to join us for further consultation. 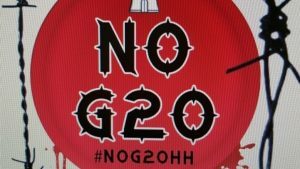 We propose an international “NoG20” meeting (preferably the day before the next action conference) in Hamburg next spring to or- ganize ourselves and become active in the NoG20 process. Please let us know what your networks and organization think. Get in touch with us throughout December and January (contact us via international@blockupy-frankfurt.org or sign up to our Email list: internation- al@blockupy-frankfurt.info). We will send all further information as soon as possible – and might call up on you for a consultation beforehand through Email or phone. Hope to see you in spring for the proposed meeting and in July for the NoG20 protest!